Where to buy Tungsten Rings? Jewelry, like clothes become dirty when worn frequently. Rings in particular become very dirty. Think about how many things we touch with our hands on a day-to-day basis! Rings are directly exposed to everything we touch, as well as our skin oils. It's important to know how to properly clean an item of jewelry; using an improper cleaning method can cause a variety of problems ranging from ruining the finish of a ring to causing rust and extreme damage beyond repair. Working in the jewelry industry I have a lot of customers that try to clean their Tungsten Carbide Rings with chemicals that inevitably ruin their once radiant, gorgeous ring(s). There are some chemicals that all jewelry should stay away from, especially bleach. I always tell our customers to either remove their ring(s) if they are going to clean, or use gloves to protect their hands and jewelry. It's a sad day when a favorite ring is ruined by harsh chemicals! If you or someone you know has a tungsten carbide ring that is in desperate need of a good cleaning, I have four simple and easy steps that will safely clean your tungsten carbide ring. The tools you will need include: dish soap, a bowl, warm water, and a soft towel or cloth. 4. Remove your Tungsten Carbide ring from the solution and dry it with a soft cloth. All done! Cleaning your Tungsten Carbide Ring does not have to be a complex or expensive ordeal. 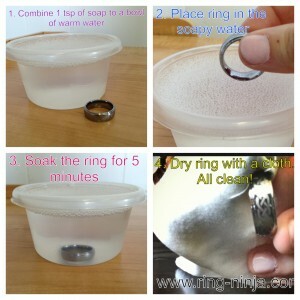 This method of cleaning your ring can be done as many times as you'd like and it won't ruin your ring. Let me know how your ring turns out, happy cleaning! Exactly How Durable is a Tungsten Carbide Ring? Tungsten Carbide rings are the most durable rings for sale in the marketplace. Tungsten will not bend or scratch; it's four times stronger than titanium and is comparable to the strength of a diamond. These rings are a popular choice for those who use their hands a lot in their day to day activities, like construction workers or electricians. Tungsten is durable enough to withstand temperatures of 1500 to -453 degrees fahrenheit. Is it Possible That My Tungsten Ring Will Break? Is it possible that a gold ring will wither away into nothing? Yes, that's possible. Is it possible that my stainless still ring will obtain scratches? Yes, that's possible. Is it possible that a tungsten carbide ring can break? Yes, this is possible but the odds are incredibly slim. For instance, if a tungsten carbide ring is run over by a truck it will most likely break. Similarly if a tungsten carbide ring was beaten with a hammer, it would probably break. It is difficult to do but it is possible. Tungsten is an element located on the periodic table as number 74. Tungsten is a dark gray color and is known for its high density, hardness, and strength. Tungsten on its own is too hard of a metal to mold into wearable jewelry, thus tungsten carbide was created. Tungsten carbide is an alloy of various metal elements that enhance the ability to shape and mold tungsten into fashionable jewelry. Will Tungsten Carbide Rings Make My Finger Green? I can't imagine the horror of celebrating the union of two souls with a green finger, so this common question has never surprised me when asked. There is a very important element to take note of when considering the purchase of a tungsten carbide ring: do not buy one whose alloy contains cobalt as it will most likely turn your finger green. Tungsten rings that contain cobalt tend to cause allergic reactions on the surface of the skin which creates an irritated green finger. Tungsten rings that are made with a nickel alloy will not turn your finger green and they are hypo-allergenic. If you or someone you know is looking to purchase a tungsten carbide ring, I hope that I was able to answer some questions that you might have. Let me know if you or someone you know has anymore questions, I'd be happy to help answer them! A reoccurring theme when searching for a wedding ring is what type of metal to purchase. There are many options to choose from, but for this particular blog post I will focus on three different types of wedding band metals: Tungsten, Stainless Steel, and Titanium. All three rings can range in price based on location of purchase, special additions to the ring (diamonds, engravings, ect) but I would like to place emphasis on which ring category will give you, the reader, a guide when purchasing your ring(s). Light weight and stylish, stainless steel is a multipurpose metal that is used for a range of products from kitchen appliances to wedding bands. These rings are generally the least expensive of the three categories I am covering, but at a price. These rings are more likely to scratch due to their lack of ability to remain durable through daily activities. This option has a great look, but if purchased, it may need to be replaced depending on use. Titanium is an extremely strong metal and like the stainless rings, is light-weight. Lightness of the material is something that some people like whereas other do not depending on style choice, perception of light-weight rings, ect. This ring is prone to scratches however it is more scratch resistant than a stainless steel ring, costing a little bit more on average than the stainless. Tungsten rings are heavier in weight and have the strongest lifetime durability out of the three categories. Tungsten is about ten times harder than 18K gold and about four times harder than titanium. Tungsten also holds its shape for forever which means the ring will not bend or wear down. Slightly more expensive than the previous metals, Tungsten rings make up for their minor price increase through their lifetime durability. Out of the three metals listed, Tungsten is by far the most bang-for-your-buck option. Cheap rings in price, Tungsten is a purchase that will last for forever. Tungsten Rings make great Promise Rings! Summer is pretty much upon us. This is the time of year for blossoming young love. Many couples delve into a deeper commitment this time of year as well. One of the best ways that we can think of is to show your commitment to one another with a set of Tungsten Promise Rings. We know that you’ve scoured the web looking for Tungsten Promise Rings, and the truth is that not a lot of marketing is done around ‘promise rings’ in the alternative metal category. 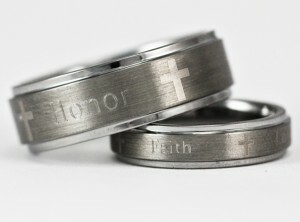 For the most part pretty much any Tungsten Wedding Ring Set will actually make a great pair of Promise Rings! Tungsten Rings are extremely durable and scratch resistant. They are the most scratch resistant metal that is used in jewelry production today. Not only will these rings make the ideal promise rings for you and your significant other, they are also very affordable if purchased from the right retailer. One online retailer – Ring Ninja, has compiled all of their products that can be worn as Promise Rings on one page for you. Although the titles of their rings will say thing like ‘His and Her Wedding Ring Set’ they do make the ideal Promise Rings. Not only do the have Tungsten Promise Rings, but they also have Titanium Promise Rings, Cobalt Promise Rings, and a very affordable set of Stainless Steel Promise Rings (these are currently just $32.99!). In addition to having a great selection of Tungsten Promise Rings, the fine people at Ring Ninja also offer custom engraving, or personalization on any of their products. All of their Promise Rings can be engraved inside or outside (ok, outside can only be performed on certain sets) which gives you an amazing oppritunity to get these rings personalized, and at the time of writing this the cost for engraving is on sale for just $15 per ring (normally valued at $24.99/ring). So tell us what you thing – are Tungsten Promise Rings right for you? Or will you stick with something even more affordable like Stainless Steel. How do you feel about personalizing your Promise Rings. We’re anxious to hear from our readers! So, how come some sites are able to sell Tungsten Wedding Rings in the $50 range, while other retailers charge as much as $500 (or more if you throw some diamonds into the mix)? We've been perplexed about that as well so we did some shopping around. One site that regularly sells rings in the 'lower' price range is Ring Ninja. If you check their site they have some quality products, there are some great reviews of their company out there, they are a better business burea member and they currently have an 'A' rating. We ordered a set of their rings for just $100, and were truly impressed with the quality of these wedding bands. The boxes on the rings were just that, boxes. Nothing fancy, no company logo printed on the box, no company logo printed on the ring, just a material stamp that says 'Tungsten Carbide'. We put these rings to the test, and they were truly amazing. They held up as well as the rings that we ordered from another 'high end' company, and in fact, appeared to be exactly the same. (The other high end company shall remain nameless). We put both sets of rings through our own scratch test, and both held up equally well. We tested both sets of rings with a spectometer and found that their material make up was identicle. So why plate a Tungsten Ring? I've gotten this question quite a bit - are Black Tungsten Rings, or Gold Tungsten Rings, the same as Tungsten Rings? Well the short answer is no. The underlying material is the same as a plain Tungsten Ring, but once you put a plating over it, the ring will be taking on the characteristics of that plating. Plating technology has improved by leaps and bounds over the last couple of decades, but it is important to remember that if you plate something with gold, than the exterior of that ring is about as scratch resistant as gold. There are so many kinds of plating for black material, the most common being a black rhodium plating - however with most Tungsten Rings you'll generally find something called IPG plating. So then, to the point, why would you plate a Tungsten Ring? For gold I think the answer is quite simple - you can get an affordable ring, that feels like gold. Tungsten and Gold are very similar in weight, so this is a great way to give you plated ring that authentic feel. We here at Tungsten Ring Info would not recommend paying more than $75 for a plated tungsten ring because of the fact that you aren't buying a very scratch resistant metal. However these pieces of jewelry can last a lifetime with a little care, and they can save you a boatload of cash - and in this economy that's really the name of the game, isn't it? If you want great deals on Tungsten and 18K Gold Rings, or Black Plated Tungsten Rings, we recommend checking out Ring Ninja. They have great prices, great quality, and most importantly, a great warranty. So, if you're looking for a website that reviews Tungsten Rings, we've found one. Over at Tungsten Ring Reviews they regularly update their website with reviews of some of the most popular styles of these rings around. Not only are the updates put out at a regular interval, they also have a section where you can submit a review of a ring that you've purchased from any site. After they take a look at what you've submitted they will get ahold of you via email to make sure that you aren't a spammer, will make any tweaks to your review (ie: spelling, censoring adult language) and then they will post your review. They seem to prefer it if you upload a picture of your own ring and they'll display it on their site, but if you provide a URL for the product that you purchased they will track down a picture and place it on their site. So once again Tungsten Ring Info is here providing all of the information, however obscure, on the topic of Tungsten Rings. So what is a Tungsten Ring? So what is a Tungsten Ring? How does it vary from other precious metal rings that have been around for 1000's of years? Well, imagine wearing a ring that is permanently polished, they will always look brand new! Tungsten Rings have an amazing, permanently polished look. They make excellent wedding bands, promise rings, engagement rings, or just awesome pieces of durable jewelry. The manufacturing process is quite extraordinary. The Tungsten and Carbide powders are forged together at about 2400 degrees fahrenheit, to form a ring blank. The ring black is then machined into the desired shape, channels are cut, and the comfort fit interior of the rings is ground using very strong, powerful, diamond grinding and polishing tools. Afterword the ring will be polished using a powerful diamond compound that involves several finishing steps. The result will be a ring that looks polished, forever. Tungsten rings offer an amazing combination of strength and style! Tungsten is the only element found on earth that can be permanently polished. The polish and finish can be as strong as your bond to each other, 20, 30, 40, even 50 years! With traditional metals such as gold or platinum (heck, even titanium) you will see varying degrees of wear. Scratching, denting, and even bending. However, with Tungsten Rings, the surface will maintain it's original, polished, strong appearance. Tungsten Carbide is a heavy material. It gives the ring a substantial feel, about the same weight as gold. This is in contrast to the first alternative metal ring, Titanium, which is ultra lightweight, almost to a fault. I've heard many people tell me that wearing one of those rings almost feels like having a piece of plastic on your hand. However, there are several people that are fans of the lightweight material - it simply does not have the durability of Tungsten. Tungsten is roughly 10 times harder than 18K gold, 5 times harder than steel, or about 4 times as hard as titanium. Due to the extreme hardness of these rings, they will hold their shape - no bending. Tungsten Rings will remain permanently polished. Tungsten with carbon and other elements are ground into a powder and then compressed with high pressure dies to form a ring blank. The blank is then fired in an oxygen free furnace at an astounding 6,200 degrees Fahrenheit. This process creates the hardest metal used for making jewelry. The ring is then cut and shaped using diamond tools with approximately 30 steps required for completion. The cutting and shaping of a tungsten ring is similar in many ways to the cutting and polishing of a rough diamond. Tungsten rings inlaid with gold, silver, platinum or mokume gane are created by grinding a channel in the center of the ring and precisely "swedging" the metal into the channel under extreme pressure. The ring is then skillfully polished with diamond polishing tools and wheels creating a permanent luster and polish not possible with other metals. A Tungsten Carbide ring will remain polished forever, and is scratch resistant. It is a unique metal that epitomizes today's man more than any other. Is there a difference between Tungsten and Tungsten Carbide? YES! There is a significant difference between Tungsten and Tungsten Carbide. Tungsten is a naturally occurring element that is very heavy and strong, but it does not have the scratch resistant properties displayed by Tungsten Carbide. Although most jewelry shops and retailers of these rings will refer to them as Tungsten Rings, most of them are in fact selling Tungsten Carbide Rings. Be leary of rings that have a material stamp on the inside that says "Tungsten", or that have company logos, what you want your Tungsten Ring to say on the inside is "Tungsten Carbide". If the ring is just simply a Tungsten Ring, you are basically purchasing a ring that is about as strong as plain steel. What is the difference between Nickle and Cobalt binders? Some manufacturers will use Cobalt to bind the Tungsten and Carbide together to make their Tungsten Ring blank. Cobalt is an easier material to work with, however in combination with Tungsten and Carbide is does not make a good binding agent. Although Cobalt has many useful purposes in jewelry, using it as a binder for Tungsten Carbide jewelry. It can actually have a negative reaction with your skin over time. Also, a Tungsten Carbide ring containing Cobalt may develop oxidation spots over time that will not be able to be removed. To solve this problem reputable manufacturers of Tungsten Rings will use a nickel binder. Although the nickel binder is harder for the manufacturer to work with, it results in a much better finished product that will not react with your skin like Cobalt will. Hi there! Welcome to TungstenRingInfo.net! So here it is, the first post. This website has been created to add some missing information to the subject of Tungsten Rings. The intention here is to post useful information so when people are searching for information on these amazing rings, they can be well informed. There are a few other sites out there that cover similar topics - all with a slightly different 'slant' on Tungsten Rings. Most of the information on this website will be original content. However there are some amazing articles and information out there on Tungsten Rings (especially videos from YouTube that people have posted) that we may link to. We will obviously give credit where credit is due. If someone took the time to share their knowledge of Tungsten Rings - then by all means we will certainly be giving them credit! Now, we know that this is not going to be the most active blog on the internet. However we would greatly value reader participation! If you ever have something to say feel free to register and post your comment. We will take a peak at the comments on a regular basis, and of course we will scan for spam and the like - but as long as your comment is not full of words that are not exactly family friendly, your voice will be heart. Another thing that we intend to do here is from time to time is weigh the virtues of Tungsten Rings agains those of other materials - in particular other alternative metal wedding rings. It seems like every couple of years now some new material is being pushed for rings, weather they be Wedding Rings, Promise Rings, Engagement Rings, or just fashion rings - something new is always on the horizon. I suspect that this is due, for the most part, to the insane rising cost of precious metals such as gold, silver, and platinum. While these rings have served mankind for 1000's of years as ideal wedding rings, it appears the time has come to move on. With that - we look forward to giving you all the information we can on these amazing, and relatively new rings. Carter on So why plate a Tungsten Ring?